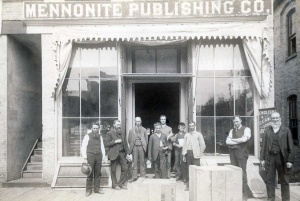 Mennonite Publishing Company Staff, 1886. L-R: John F. Funk, Jacob Oberholtzer, Abram K. Funk, James Garlinger, Abram B. Kolb, Samuel F. Coffman, Nelson Blough, Louis Rutter, Joseph Summers. The Mennonite Publishing Company, Elkhart, Indiana, the successor to the firm of John F. Funk and Brother, was chartered in 1875 and completed its chartered life of 50 years, although it sold its periodical publications (Herald of Truth and Mennonitische Rundschau) in 1908 to the Mennonite Publication Board which had just created the Mennonite Publishing House as the publishing agency for the Mennonite Church (MC). The Mennonite Publishing Company was a stock company, whose stock was widely held in the eastern Pennsylvania section of the Mennonite Church. Due largely to a bank failure and a fire it was forced to bankruptcy in 1903 with heavy loss to its stockholders. Its president throughout its history and business manager until about 1900, was John F. Funk (1835-1930), an outstanding leader in the Mennonite Church (MC). The Mennonite Publishing Company did an outstanding service in its book and periodical publications both in German and English, serving not only the Mennonites and Amish Mennonites but also a large block of the Russian Mennonite immigrants, particularly in Manitoba. For the latter group it published the Mennonitische Rundschau and hymnals, catechisms, and confessions of faith. Due to Funk's deep historical interest the Mennonite Publishing Company and its predecessor, John F. Funk and Brother, published two notable large historical works, Menno Simons' Complete Works (English 1871, German 1876), and the Martyrs Mirror (German 1870, English 1886). Funk became the major publisher for the Mennonite Church (MC), publishing its hymnals, catechisms, confessions, yearbooks, Sunday-school literature, etc. Through his press as well as his personality Funk wielded immeasurable influence upon the cause and molded the course of its history in the second half of the 19th century, working for unity and progress. It was a tragedy that in his later years he lost much of the confidence of the church he once had, so that from about 1900 on his publishing work decreased in size and influence. During the years 1880-1900, the Mennonite Publishing Company became the center of a group of younger progressive men, who found in its activities almost the only available outlet for their desire to serve in the church and who made significant contributions to the new day in the church. Among these were A. B. Kolb, A. C. Kolb, F. W. Brunk, John S. Coffman, G. L. Bender, and John Horsch. Bender, Harold S. "Mennonite Publishing Company (Elkhart, Indiana, USA)." Global Anabaptist Mennonite Encyclopedia Online. 1957. Web. 20 Apr 2019. http://gameo.org/index.php?title=Mennonite_Publishing_Company_(Elkhart,_Indiana,_USA)&oldid=133228. Bender, Harold S. (1957). Mennonite Publishing Company (Elkhart, Indiana, USA). Global Anabaptist Mennonite Encyclopedia Online. Retrieved 20 April 2019, from http://gameo.org/index.php?title=Mennonite_Publishing_Company_(Elkhart,_Indiana,_USA)&oldid=133228. Adapted by permission of Herald Press, Harrisonburg, Virginia, from Mennonite Encyclopedia, Vol. 3, p. 634. All rights reserved. This page was last modified on 28 December 2015, at 07:05.